Patination oil protects bright-rolled lead sheet against the formation of streaks, and ensures a uniform surface look. After laying lead sheet, it may react to rainwater during the initial weeks. White lead is formed on the blank metal surface, which becomes visible in the form of unattractive streaks on the covering materials positioned below. Patination oil is used to counteract this effect, and supports the formation of the natural silver-grey patina. It adheres firmly and is almost insoluble. Patination oil is especially adapted for lead sheet, and therefore ensures particularly reliable and rapid protection. Patination oil is sold in 1 litre plastic bottles. The precise dosage of up to 25 ml is a characteristic of the packaging. The bottles must be well-shaken before use. 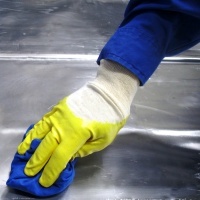 Patination oil is evenly and sparingly applied to clean and dry lead sheet surfaces using a cotton cloth. Depending on the weather, the oil will dry in approximately 1 hour. After this time, the lead is already protected against humidity and streak formation. An area of 60 m² can be treated with 1 litre of oil.